Most people don't understand how vital a role food plays in improving your mood. Trudy Scott, certified nutritionist (CN), educates women about the amazing healing powers of food and nutrients and helps them find natural solutions for anxiety and other mood-related issues. 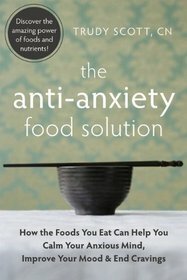 She is the founder of Every Woman Over 29, a thriving nutrition practice with a focus on food, mood and women's health, and is the author of The Anti-Anxiety Food Solution -- How the Foods You Eat Can Help you Calm Your Anxious Mind, Improve Your Mood and End Cravings (June 2011, New Harbinger). Trudy's goal for all her clients (and all women): "You can be your healthiest, look your best and feel on-top-of-the-world emotionally!" Here are nine ways that you can improve your mood without medication today! With this food-mood approach you may become free of anxiety, have no more panic attacks and feel super-confident. Each person has their own unique biochemistry and there may be other factors involved, but this would be a great start. Good luck! For more by Clarissa Burt, click here.